Over the four-day Halloween/All Saints' Day/All Souls' Day long weekend, I took a respite from reading the classic novel, Gone With The Wind, to get spooked read something that's thematically apt for the holiday. I had been provided with a PDF copy of this book for a couple of months now (thanks to Kwesi), and I was particularly saving reading it for Halloween. The Woman In Black: A Ghost Story is about a young Brit lawyer, Arthur Kipps, who was tasked to tie up the loose ends in the estate of the deceased Mrs. Alice Drablow. In order to manage her affairs, Arthur had to travel a long way away to a remote part of England, far from London, where their law office is based. Eel Marsh House, the mansion of the late Mrs. Drablow, stands on an isolated patch of land surrounded by marshes, which practically becomes an island come high tide. Ingress and egress are possible only during low tide, and if the fog doesn't cover the surrounding areas, which included an old burial ground. When I commenced reading the book, I was prepared to be scared, but nothing could have prepared me for the intensity with which I got the creeps. I mean, I was scared sh*tless. Seriously. It could have been just the graphic, accurate writing, or it could be that I have such a vivid imagination that I could picture clearly in my head the scene as it was described, or I'm really just a scaredy-cat that I was shivering with goosebumps reading every other chapter. The thing with ghost stories, though, is that you've heard a lot of them, with variations each time they're told, that they tend to get predictable after each retelling. Almost always, there's a reason for this apparition or that, there's a restless soul that needed closure, or there's something that needed to be done in order for the recently departed to "cross over". It is no different with The Woman In Black. 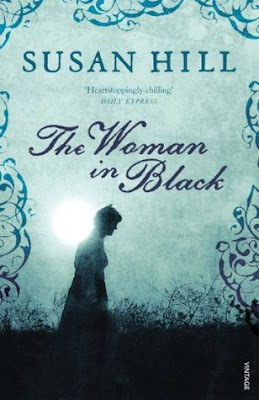 Before I read the last chapters of the book, I pretty much had a good idea of who the actual woman in black is, why she was doing what she was doing, and what will become of our protagonist, Arthur. It was that predictable that my guesses were accurate, and, somehow, that fact diminished the scare factor that the novel held for me in the first few chapters. Nonetheless, The Woman In Black succeeded in what it was supposed - and what I expected it - to do: scare me witless, at least for the most part. There were parts when I literally got exhausted from reading - I didn't appreciate the compound, too-long sentences which were difficult to follow. But, all in all, it was the perfect Halloween read, and I liked it very much, for what it was worth. I can still imagine how the "wasted" and "sunken" face of the woman in black looks like.... and I have to shake the image off my head. I value my precious, dreamless sleep, thank you very much.